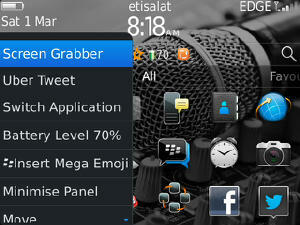 Unlike the default screenshot capability of BlackBerry 10 devices, BlackBerry OS7 devices do not have a built-in way to take a screen capture. 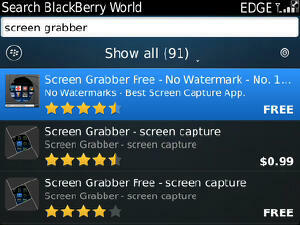 Instead, we use a third party application from BlackBerry App World to successfully capture screen moments. The most popular app for this purpose is Screen Muncher by Motek Mobile, known for its unique large mouthed monster watermark. Screen Muncher was cool to use though untill people began to realise that watermarks were not. If you don’t know what a watermark is, it is tag (logo or text) which is added automatically to every picture you take within an app. It’s just like the app developers saying: “If you must take photos or screenshots with our app, then we must attach our logo to all the photos”. Yeah, copyrights are good but not when it defeats the purpose of the app. I even came across a screenshot app which adds watermark large enough to cover half of the pictures. So How Do I Take Screenshots Without a Watermark? 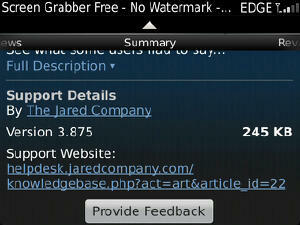 You need the Screen Grabber app by The Jared Company. It is clean, fast, effective, and does what it is supposed to do. When this app is installed, the default way to capture screens with it is from the menu, as shown in the first image of this article. To make things easier, you can set it to use your convinience key (the button on the right side of your BlackBerry 9900 phone). Navigate to Options > Device > Convinience key, then choose Screen Grabber from the dropdown list. That’s all.